If you are based in Edinburgh for more than a few days, you may like to consider a day trip or two, visiting some of the nearby attractions. 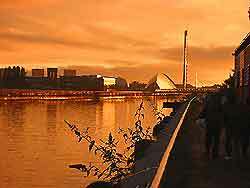 Glasgow is likely to be your number one excursion and is located roughly 51 miles / 82 km to the west, where it comes with numerous theatres and museums, as well as some striking architecture - old and new, such as the Clyde Auditorium, the city's cathedral and Charles Rennie Mackintosh's famous School of Art. Excursions to both East Lothian and Midlothian may also appeal, with attractions including country parks, castles and stately homes, while to the west of Edinburgh, the Firth of Forth comes with many attractions, including the fortified islands of Inchcolm, Inchkeith and Inchmickery, the latter of which now serves as an important RSPB nature reserve. Roughly an hour to the north-west is the city of Stirling, which straddles the Forth River and is often referred to as being the 'Gateway to the Scottish Highlands'. Glasgow is Scotland's largest city and is well-known for its excellent entertainment, shopping, nightlife and general culture. Situated around one hour's drive from central Edinburgh, many tourists come here to sightsee. The flat landscape of East Lothian is bordered by the Firth of Forth and the Lammermuir Hills. East Lothian is within easy reach of Edinburgh, with visitors often heading here to check out the sandy beaches of Gullane and Yellowcraig. The spectacular Pentland Hills cover more than 20,000 acres / 8,100 hectares and lie to the south of Edinburgh, on the A702. The Pentland Hills Regional Park is one of the principal attractions in this area and features a golf course, the longest dry ski slope in Europe and a vast country park. To the west of Edinburgh, many old slag heaps provide a reminder of the area's coal mining and heavy industrial past. Close to the airport, the village of Ratho is home to many noteworthy attractions. 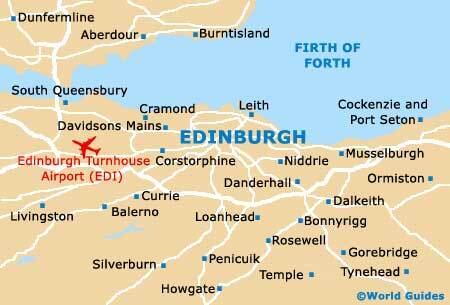 Other areas of interest to the west include Tamfourhill, Linlithglow, the Firth of Forth and South Queensferry. Fife is situated to the north of Edinburgh and from any high point in the city you will see Fife on the far shore of the Firth of Forth. With many picturesque views and popular tourist draws, Fife has much to offer day trippers. The Borders is one of the most scenic areas of Scotland, with pastoral landscapes, a stunning coastline, picturesque towns and numerous historic abbeys, being located just under an hour's drive to the south-east of Edinburgh. For many hundreds of years, Stirling has been one of Scotland's key strongholds and is situated just above the River Forth. Home to two of the most important battles against the English, Stirling is steeped in history and has numerous interesting attractions for visitors from Edinburgh.